Ask people what they know about Antarctica and they usually mention cold, snow and ice. In fact, there’s so much ice on Antarctica that if it all melted into the ocean, average sea level around the entire world would rise about 200 feet, roughly the height of a 20-story building. Could this happen? There’s evidence that at various times in the past there was much less ice on Antarctica than there is today. For example, during an extended warm period called the Eemian interglacial about 100,000 years ago, Antarctica probably lost enough ice to raise sea level by several meters. Scientists think that global average temperature back then was only about two degrees Fahrenheit warmer than today. Assuming we continue to burn fossil fuels and add greenhouse gases to the atmosphere, global temperature is expected to rise by at least two degrees Fahrenheit by 2100. What will that do to Antarctica’s ice sheet? Even one meter of worldwide sea level rise – that is, melting only a fiftieth of the ice sheet – would cause massive displacements of coastal populations and require major investments to protect or relocate cities, ports and other coastal infrastructure. Ice leaving Antarctica enters the ocean through ice shelves, which are the floating edges of the ice sheet. We expect that any changes to the ice sheet caused by changes in the ocean will be felt first by the ice shelves. Using satellite data, we analyzed how Antarctica’s ice shelves have changed over nearly two decades. Our paper published in Science shows that not only has ice shelf volume gone down, but losses have accelerated over the past decade, a result that provides insight into how our future climate will affect the ice sheet and sea level. The link between changing global temperature and ice loss from Antarctica’s ice sheet is not straightforward. By itself, air temperature has a fairly small influence on the ice sheet, since most of it is already well below freezing. It turns out that, to understand ice loss, we need to know about changes in winds, snowfall, ocean temperature and currents, sea ice, and the geology under the ice sheets. We don’t yet have enough information on any of these to build reliable models for predicting ice sheet response to climate changes. 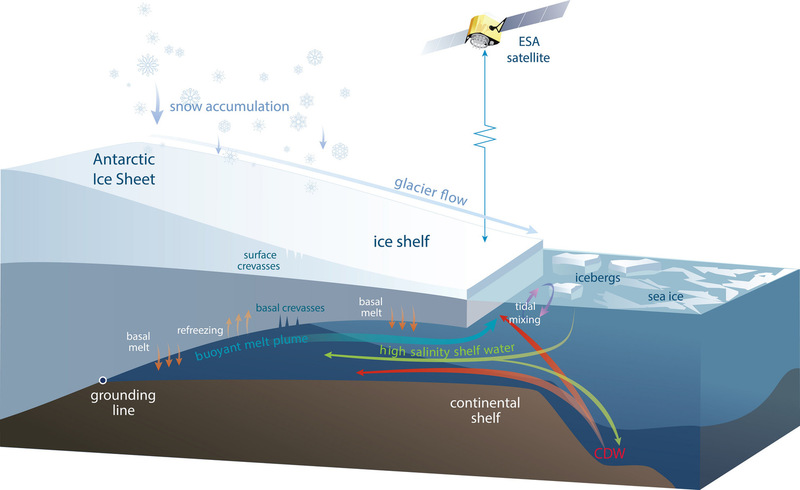 We do know that one important control on ice loss from Antarctica is what happens where the ice sheet meets the ocean. 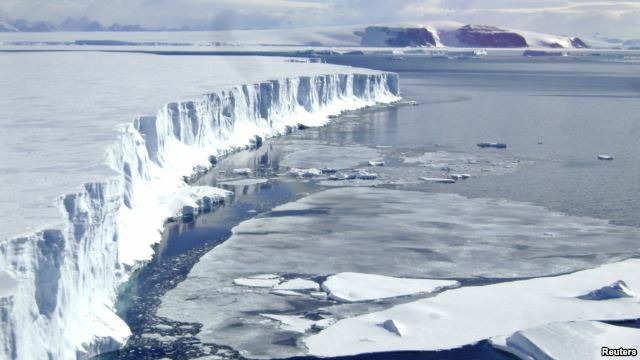 The Antarctic Ice Sheet gains ice by snowfall. The ice sheet spreads under its own weight forming glaciers and ice streams that flow slowly downhill towards the ocean. Once they lift off the bedrock and begin to float, they become ice shelves. To stay in balance, ice shelves have to shed the ice they gained from glacier flow and local snowfall. Chunks break off to form icebergs and ice is also lost from the bottom by melting as warm ocean water flows under it. Schematic diagram of an Antarctic ice shelf showing the processes causing the volume changes measured by satellites. Ice is added to the ice shelf by glaciers flowing off the continent and by snowfall that compresses to form ice. Ice is lost when icebergs break off the ice front, and by melting in some regions as warm water flows into the ocean cavity under the ice shelf. Under some ice shelves, cold and fresh meltwater rises to a point where it refreezes onto the ice shelf. An ice shelf acts a bit like a cork in a champagne bottle, slowing down the glaciers flowing from the ground into it; scientists call this the buttressing effect. Recent observations show that when ice shelves thin or collapse, the glacier flow from the land into the ocean speeds up, which contributes to sea level rise. So understanding what makes ice shelves change size is an important scientific question. The first step towards understanding ice shelves is to work out just how much and how quickly they have changed in the past. In our paper, we show detailed maps of changes in ice shelves all around Antarctica based on the 18 years from 1994 to 2012. The data came from continuous measurements of surface height collected by three European Space Agency radar altimeter satellites. By comparing surface heights at the same point on the ice shelf at different times, we can build a record of ice height changes. We can then convert that to thickness changes using ice density and the fact that ice shelves float. Prior studies of changes in ice shelf thickness and volume have given averages for individual ice shelves or approximated the changes in time as straight-line fits over short periods. In contrast, our new study presents high-resolution (about 30 km by 30 km) maps of thickness changes at three-month time steps for the 18-year period. This data set allows us to see how the rate of thinning varies between different parts of the same ice shelf, and between different years. This map shows eighteen years of change in thickness and volume of Antarctic ice shelves. Rates of thickness change (meters/decade) are color-coded from -25 (thinning) to +10 (thickening). Circles represent percentage of thickness lost (red) or gained (blue) in 18 years. The central circle demarcates the area not surveyed by the satellites (south of 81.5ºS). Original data were interpolated for mapping purposes. We find that, if recent trends continue, some ice shelves will thin dramatically within centuries, reducing their ability to buttress the ice sheet. Other ice shelves are gaining ice, and so could slow down the loss of ice from the ground. 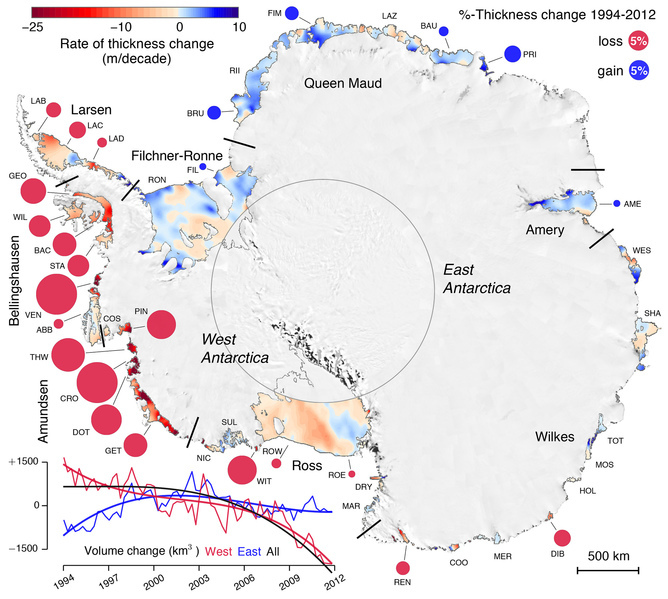 When we sum up losses around Antarctica, we find that the change in volume of all the ice shelves was almost zero in the first decade of our record (1994-2003) but, on average, over 300 cubic kilometers per year were lost between 2003 and 2012. The pattern of acceleration in ice loss varies between regions. During the first half of the record, ice losses from West Antarctica were almost balanced by gains in East Antarctica. After about 2003, East Antarctic ice shelf volume stabilized, and West Antarctic losses increased slightly. Changes in climate factors like snowfall, wind speed and ocean circulation will lead to different patterns of ice shelf thickness change in time and space. We can compare the “fingerprints” of these factors with our new, much clearer maps to identify the primary causes, which might be different in different regions around Antarctica. Our 18-year data set has demonstrated the value of long and continuous observations of the ice shelves, showing that shorter records cannot capture the true variability. We expect that our results will inspire new ways of thinking about how the ocean and atmosphere can affect ice shelves and, through them, ice loss from Antarctica.